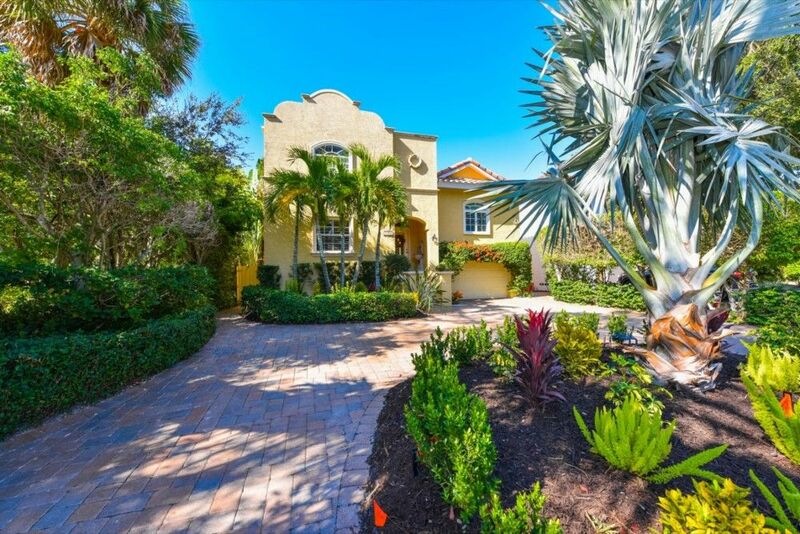 Welcome home to this lovely retreat where Spanish Mediterranean meets Siesta Key Island Living. This Grand Canal waterfront home is located just 2 short blocks from the powdery white sands of Siesta Beach and close to the shops and eateries of Siesta Village. Its unique and custom Mediterranean style was tastefully remodeled with charm and designer finishes at every corner. Stunning travertine floors with tumbled marble accents add to the casual elegance throughout the home. Entertain family and guests with the upgraded kitchen, featuring 42" wood cabinetry, granite counter tops, new stainless steel appliances, breakfast bar and dining area. Cathedral ceilings, plantation shutters, newly carpeted bedrooms, new paint and wallpaper. Retreat to the private owner’s suite with vaulted ceilings, large windows, walk-in closet and a luxurious master bath featuring wood cabinets, Jacuzzi tub, walk-in shower. Take your pick of lower or higher level private bedrooms, tastefully decorated and ready for family or guests. Enjoy the gathering room with built cabinetry, which leads to the covered balcony with more water views. Or, take the short stairway to the covered patio with summer bar, perfect for al fresco dining. Don’t miss the changing cabana so you can take a dip in the sparkling, heated pool while enjoying fabulous water views which leads to the boat dock with lift. New landscaping, paver circular driveway. Within minutes o downtown Sarasota. Make your island home now! Click virtual tour for 3D Walkthrough. Driving Directions: Beach Rd., East on Avenida del Mare, cross Canal Rd. House in on your left.